We are having an Indian Summer with temperatures soaring again. I wonder if that's why some leaves have such a riot of color, layer upon layer. I can hear them sighing, "Ah, cooler temperatures. I think I'll turn a lovely shade of amber." And then, suddenly, a wail of "Yikes! What the heck?!" can be heard from high in the trees as temperatures do an about-face and climb. Because they've released their lovely green protection, the leaves then turn bright red from sunburn. I used Impression Obsession leaf dies for the large maple leaf. I liked the dies so much that I bought the mini version some time ago, so the smaller maple leaf is NBUS from that set. The NBUS thank you sediment is from Altenew's "Magnolias for Her" set. A rummage through my v.o. papers turned up this cool sheet that reminds me of wood veneer. You may have seen in Blogland that Altenew is holding a hop showcasing many of our favorite challenges. Certainly favorites of mine! Seeing Kathy's fabulous 30-Day Marker Challenge in the line-up made me wish my NBUS Challenge had been among the participants, but you all know that I join May and the ladies of Altenew in wholeheartedly thanking these challenges for all the hard work they do, sometimes week-after-week. That takes tremendous dedication! I couldn't wait to join in the hop and I hope you can, too! I give the same sincere thanks to so many other amazing challenges that I am constantly inspired by and love to play in. I never have to draw a blank when it comes to card design with so many ideas to spark my creativity! 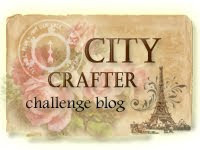 City Crafter Challenge: Turning a new leaf. TIME OUT Challenge: Photo inspiration. 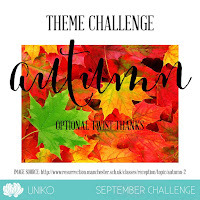 Uniko Challenge: Autumn. Optional twist: Thanks. His name is Cisco and he's a Havanese. He owns the Mister's sister. She and her mister are off on vacation. Yes, Hammy and Freckles are jealous. Duke and Jack would be jealous, too, if they only knew! And, yes, you'll have to forgive any typos. His chin is literally on the keyboard! Love your card Darnell, cos I love Autumn, fabulous colours and design. Your card is fabulous - I love your choice of Kraft card it really adds to the autumnal feel. Simply stunning! Thanks for the kind comments you left on my post. Wow, stunning Darnell. Gorgeous colours on this wonderful card and Cisco is such a sweetie. Your card is gorgeous, your temporary dog is gorgeous and your weather sounds gorgeous too, unlike the all-night thunderstorm we had here the night before last. We have a colder wet spell with temps in the high teens, after temps in the high 20s and even up into the 30s. Yesterday and today we have humidity in the 90s, so feels much warmer. What a cutie Cisco is. 'Scuse the delay. Had to go change my pants. "He owns the Mister's sister." Tracey and I (as proud Havi owners) can only confirm that you've hit the nail on the head. A really stunning and elegant CAS creation Darnell, so love all the Autumnal (sorry Fall) colours. Your ward for the week looks adorable. What a beautiful card Darnell - love your leaves and that paper is the perfect foil for them. Your wee visitor looks right at home there - my cat used to do that to me too. Fabulous card, perfect for the season and for masculine or feminine recipients! Love these leaves very much! Love your card that leaf is beautiful and oooh that pup is adorable!! You're looking really lovely too BTW! I forgot to say - Thank you so much for playing along at CCCB!! I think Cisco is ready to stay for a long time! Love your fall card...the leaves are gorgeous! Your maple leaves pop against the wood look of your background paper. l love the doggy pictures! We're enjoying hot days still here in Georgia. Beautiful CAS card, Darnell!! You captured the beauty of fall with your beautiful leaves. Love the background too - it looks textured and rich - perfect autumnal feel! Beautiful card, Darnell. You have so descriptively created a believable senario of what leaves must go through in CA! Yikes! Thanks for sharing your gorgeous card, too! And thanks as well for the lovely picture of you and your new little friend. What an adorable dog with soulful eyes. Thanks so much for sharing!! Have a great weekend. :) Hugs! ps... you look fantastic ! I really like the stenciled-brusho background papers they are so interesting. Your fall card is also charming and the textured paper is a great look. Now for the puppy they are the softest critters ever almost like a stuffed animal. You be careful that cutey pie is going to steal your heart. Love your card Darnell ..... beautifully CAS. We're enjoying some late summer sunshine finally .... and it's still quite warm too which is nice. The leaves have started falling though which means Autumn is on it's way. Gorgeous fall card Darnell! Now if the temps would quit fighting we could settle down and have an autumn! Your house guest stole my heart! Such a lovely CAS card Darnell. What a sweet little face. My son used to have a pup that looked very much like Cisco. So adorable. Beautiful card. I love the mottled look of the leaves on that textured cardstock. Cisco is adorable. I want to just hug and hug him. Duke and Jack will know the next time they come. You are in trouble now! This card is lovely Darnell. I love the way you created those pretty leaves. The look great against that background. And your little house guest is adorable. Enjoy!! Love the colours you put in your autumn leaves! 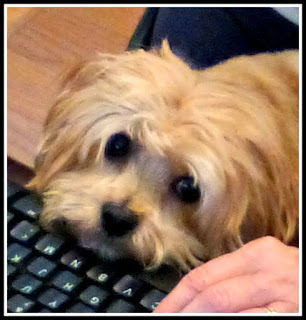 And love that cute little dog - Havanese are wonderful. They are on my list for when I'm older and need a smaller dog than my English Cockers. Enjoy having him! Beautiful card and I love the colors of Autumn. We are beginning to warm up a bit but last week it got down to 39 degrees overnight. Brrrr! That chilled me to the bone. We are not used to that right now. 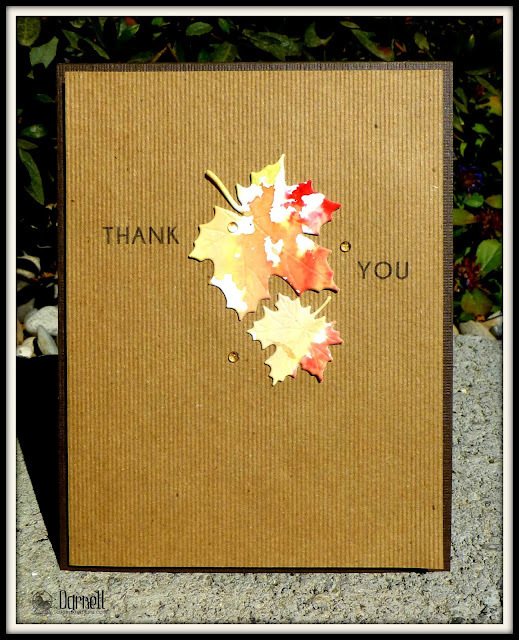 Your leaves are coloured beautifully and what a perfect thank you card too. What a perfect seasonal card with those gorgeous leaves - BUT - that pooch is utterly adorable and has made himself right at home! 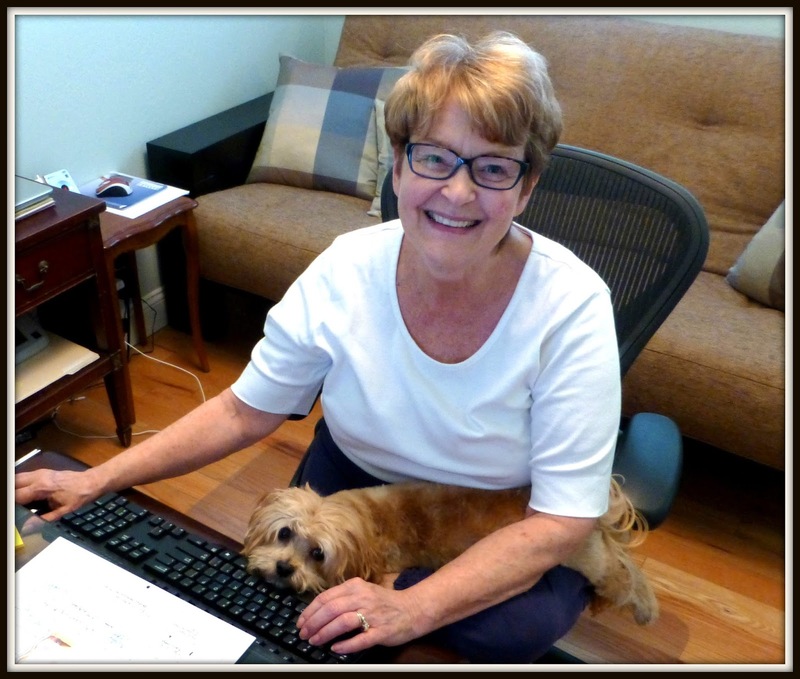 I've heard of lap dogs, but he's apparently a laptop dog! SO cute!!! Glorious autumnal card Mrs K. You have captured the essence of the season in card beautifully. Cisco is adorable. He looks very at home with you. Your leaves are so pretty and the paper is the perfect background for this perfectly CAS card! Our leaves are so tired of the heat that they're turning brown and wrinkly and falling down. Your guest is adorable! I think he's besotted with you. Darnell, this is just gorgeous! I thought red leaves were blushing with embarrassment because they took off their green coats. Now I see that the are actually sunburnt. Poor things! Easy peasy card! I needed fall inspiration today. I had some but it was slippy and got away. I love that background paper - and the lovely leaves upon it, Darnell. It looks like corduroy to me. Cisco is so cute it's no wonder he owns people instead of the other way around. I do so love the colors of fall. And fall itself is not so bad either. It's what comes after it that I don't like very much. Cold and snowy weather is just not my thing! But I love colorful maple leaves. And I love cardstock that is textured. And I'm a sucker for a cute pooch too. Super fab card too Darnell. Beautiful simplicity , love your card! Thanks for linking up at Uniko. That's a beautiful CAS autumn card Darnell and you have inspired me to get my Brusho's out to play with again. I love the Kraft background with those gorgeous autumn hues. I love your wonderful description of the leaves and your beautiful card! Great take on the sketch! Your card is beautiful. Love those colored leaves. Thanks so much for playing along at Time Out this week. Now, that's a face anyone would love...such a help when composing blogposts, too. And your card screams Autumn although, the current weather does not. Yuck. I have noticed, however, that evenings are cooling here, quited nicely. Don't get too attached to your little friend...I know I'd find it hard to return him. Oh look at at that face, and that leg just hanging there. That is one happy pup! Love your fall card and the touches of color. Autumn has such a vibrant feel. Beautiful Autumn card, love the colors and also the white spots in your artistic leaves, Darnell. I think that Cisco is the cutest little guy, and he looks so relaxed and happy with you, seems like he is your dog for a long time... you really have a special sensibility to deal with those cutie patooties. What an adorable house guest! So cute. Love the leaves on your card too. Oooh!! your card is as delightful as your "nephew"!! Sweet as can be Darnell. We seem to have already had our Indian Summer here as the temperatures have now taken a bit of a dive. Love this card Darnell - absolutely beautiful leaf, and wonderful design as always. Squeal here, Cisco is so cute! We'd love a Havanese, such a cutie! Beautiful card, Darnell. And yep, Indian summer here too. Beautiful card, Darnell! And what a sweet little doggy! Gorgeous card. Clean, simple, awesome texture, nice bits of bling!!! Love the leaves. But little Cisco steals the show in this post! Could he possibly be any cuter? Wonderful fall card and gorgeous pooch. I hope he's picking up a few crafting tips from you, hanging so close by and all. Enjoy Indian Summer while you can! It will be cold before you know it. Love your leaves on your pretty card. Fabulous! Cisco looks quite comfy. Oh what a beautiful Autumn card Darnell - really love that maple leaf die. I may have to add to my mile long wish list - especially as fall cards are so popular in challenges etc. Also love that background, the perfect backdrop. Loving this gorgeous fall card! Congratulations on being in the altenew lineup! You look so adorable in that photo, I'm not sure who I think is more adorable,you or the dog! Glorious leaves against that texture-y DP, Darnell ... the smooshy variegated colour adds such delicious depth ... and I love those tiny drops of morning dew glistening in the light! Delighted to have you playing along with us at Time Out! Love your gorgeous fall leaves! The woodgrain and tiny drops of dew are perfect and lets me get a hint of my favorite season. Like you, our high temps keep us from feeling like autumn is here. We're still in the 90's with terrible humidity.They're predicting cooler days next week--but I think I've heard that one before! Goodness, I forgot to comment about your little visitor! So adorable, I think he considers you a pretty special substitute mom as he looks quite at home! Hi Darnell--Trying to catch up & reading your posts. Had to stop at this one--beautiful leaves, but I know you won't be surprised that Cisco stole my heart! At first glance, Darnell, I thought that was a pic of Cath Edvalson! What a striking resemblance! I love your card--the leaves are beautifully inked and I love the texture behind them. Love your CAS card. Cisco looks lovely too, so cute. Just popping in to add my congratulations on you CTS Favorite win. Congrats on the CTS Faves honor, it's really a great card! Super cute pup too! Congrats on the HM at CTS! I gave up long ago on getting noticed there--haha! Beautifully clean and simple! I love the textured card and the leaves are just so pretty! Thanks so much for playing along with Uniko this month! Deborah, DT. A gorgeous Autumanl CAS card, I love the simplicity of it Darnell.